Could women help fix broken Japan? There have been a lot of serious articles in serious newspapers over the past few weeks asking essentially the same question - has Abenomics failed? To me it seems like the wrong question. The more pertinent question should perhaps be - why did anybody think Abenomics would work? Abenomics is the term Japan's Prime Minister, Shinzo Abe, has, in a rather self-aggrandising way, given to his plan to get Japan's economy out of deflation, and back in to growth. When he launched it nearly two years ago there was much fanfare and much excitement. Even such an illustrious economist as Paul Krugman declared himself a supporter. But now, 18 months on, Japan's economy is back in recession, and support for Mr Abe - who faces a General Election on Sunday - has been dwindling. In the very simplest terms, Mr Abe and his government tried to do two contradictory things at once. To use a car analogy - he put his foot on the accelerator and the brake at the same time. In spring 2013 Mr Abe put with his foot hard on the accelerator. Lots of money was pumped in to the Japanese economy. The government went on a spending spree (fiscal stimulus), and the Bank of Japan printed vast amounts of new money, which was then used to buy assets (quantitative easing). And for a while that seemed to work. But then in April this year Mr Abe put his foot on the brake - he raised sales tax from 5% to 8%. If you live in Europe, where VAT rates are closer to 20%, that may seem like a paltry rise. But in Japan the result was dramatic - Japanese consumers stopped spending. The economy went into reverse - from growing at a rate of over 6% to shrinking at -7.3%. Mr Abe brushed that off as a blip, the short-term result of the tax rise. But the contraction has continued. Between July and September Japan's economy shrank again, although at a much lower rate of -1.6%. Why did Mr Abe think it was a good idea to raise taxes just as the economy was starting to grow? He didn't. But his government was under tremendous pressure to do something about Japan's massive debt mountain. It currently stands at about 240% of GDP. In other words it would take nearly 2.5 years of everything that Japan produces to pay off what the government owes. The only other country that comes close to that is Zimbabwe. The UK's national debt is, by comparison, 91% of GDP. Getting Japan's debt to at least stop growing so fast is seen as vital to maintaining confidence in the Japanese currency. In the same week that Mr Abe said he would delay a further tax rise, the ratings agency Moodys downgraded Japan's credit rating. This brings me back to my original question - why did anybody think Abenomics would work? The reason I ask that is because most of the economists I talk to agree that Japan's economic woes are not the result of a short-term cyclical drop in demand, they are deep and structural and difficult to change. The biggest challenge facing Japan is demographic. Japan is shrinking. Its working age population peaked in the mid-1990s at about 86 million people. Since then it has fallen by nearly 10 million to 77 million today. Japan's birth rate, at about 1.3 children per woman, is similar or even higher than many European countries. But countries such as Britain, France, Germany and Italy have staved off population decline by importing workers. Japan, on the other hand, remains adamantly opposed to large-scale immigration. And so Japan's population is ageing and shrinking faster than any other country in the developed world. There is a simple rule of economics from which even Mr Abe cannot escape - growth can be achieved either by employing more people or increasing productivity per worker. For Japan the maths of economic growth simply do not add up. Mr Abe appears to have pinned his hopes on Japan exporting its way out of trouble. If you can't sell more stuff at home, then sell it to foreigners. And to help with this, his government has deliberately and dramatically pushed down the value of the Japanese Yen. Today it is worth nearly 25% less against the dollar than when he came to power. A weak yen makes Japanese exports cheaper, and so more people in America, Europe and China will buy them. Or so the theory goes. Except it hasn't worked. In 2013 Japanese exports declined. This year they have been largely flat. One reason is that demand all around the world is still low, the prolonged after-effect of the 2008 crash. More worrying for Japan is the fact that more and more Japanese products are no longer made in Japan. Over the past 20 years big Japanese corporations have been exporting jobs, to the US, China, and South East Asia. Next year the number of "Japanese" cars made outside Japan will overtake the number made at home for the first time. The falling value of the yen has been great for companies such as Toyota, which has reported record profits. But it hasn't increased demand for cars from its factories in Japan. This does not mean that Japan is finished. But getting more growth out of a declining population is very hard. One answer could be women. In simple economic terms, women are a valuable resource. Japan has one of the most highly educated female populations in the world. And yet much of that talent is going to waste. Compared to their counterparts in North America and Europe, far more Japanese women give up full-time employment after they have their first child, and fewer go back to full-time work once their child is in school. According to a research paper by Kathy Matsui, at Goldman Sachs in Japan, getting full-time female employment up to the level of Italy could add 15% to Japan's GDP. Prime Minister Abe has declared himself a fan of what has become known as "Womenomics". He has set an extremely ambitious target that by the end of this decade, 30% of all managers in Japanese companies should be women. There are lots of reasons why this won't happen. Primary among them is Japan's work culture. Talk to any professional Japanese woman about her experience in the corporate world and you are likely to hear a similar story. Work hours are extremely long, routinely extending far into the evening. Male-dominated social drinking is a part of corporate life. Taking time off to have children destroys promotion prospects - as does leaving the office "early" to make dinner for your children. In short, trying to balance family life and a full-time job is almost impossible. I recently spoke to a female graduate from one of Tokyo's top universities who told me that when she went to interview for a large Japanese trading company one of the first questions they asked was: "Do you plan to get married?" Despite a 1986 law banning it, endemic discrimination against women in the workplace is still rife. Meanwhile Prime Minister Abe's ambitious target for Japan's corporations does not appear to extend to his own party. A general election is due to take place here on 14 December, for the lower house of parliament. Of the 342 candidates so far named by the ruling Liberal Democratic Party only 36 are women, just 10.5%. Some of Japan's problems are unique. But the biggest one is not. Since the dawn of the industrial age people in industrialised countries have come to expect almost continuous economic growth. But across the globe birth rates are collapsing. Europe is greying fast. Soon South Korea, Taiwan, Hong Kong, Singapore and even China will follow. In much of the world, the era of high growth may be coming to an end. In that respect, Japan's two decades of low growth may represent something of a success, and a new norm. 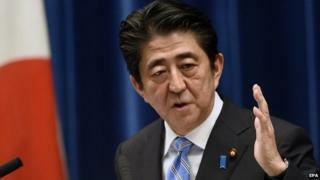 Video Why has Japanese PM Shinzo Abe called an election?